This meal features Paige’s favorite foods of all time: grape tomatoes, peas and whole corn kernels–with tofu on the side. Light and fresh, it’s the perfect lunchtime fare and made using frozen veggies, you can enjoy it year-round. This dish is a really fun one for older babies developing their pincer grasp with tons of tiny and colorful shapes to choose from. Bring a medium pot of water to boil, add the peas and corn and cook for 1-2 minutes at a rolling boil. Drain and rinse under cold water to stop the cooking process – set aside. In a medium mixing bowl, whisk together 3 tablespoons olive oil, balsamic, Dijon, sweetener and salt and pepper. Add quartered grape tomatoes, drained corn and peas, green onions and basil. Toss gently to combine then set aside. In a large non-stick skillet, heat 2 tablespoons olive oil over medium-high heat. Add the crushed garlic and saute about 30 seconds, until fragrant but not browned. Place flour in a shallow dish and season generously with fresh cracked pepper. Coat each tofu strip in the flour mixture and place in the skillet. Lightly season with tamari, frying each side about 2 minutes. 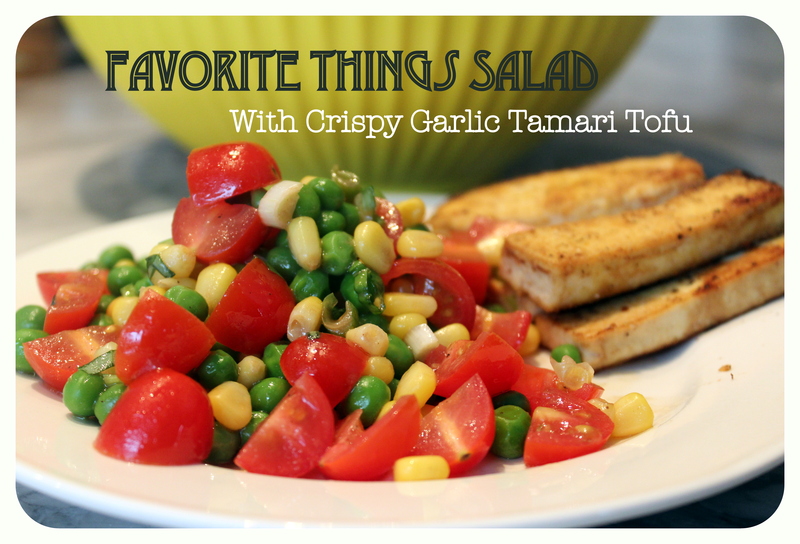 Serve and enjoy with the corn, pea and tomato salad. This entry was tagged baby led weaning, lunch, salad, side dish, toddler, Vegan, Vegetarian. Bookmark the permalink.